Absolute Steel Texas is the Texas operations and manufacturing facility for Absolute Steel. We are a family owned business that has been in business since 1999. Operations in Arizona are where all company records are maintained and policies for both locations originate. 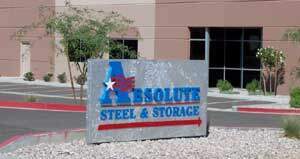 Absolute Steel Texas operates independently of Arizona both legally and from an operational standpoint. While its primary function is to service our wholesale accounts, we do service the general public from our Texas location. When you deal with Absolute Steel Texas, you are doing business with the people who actually manufacture the product—we’re not a website drop shipping from someone else’s factory or a broker who is done with you after he receives your deposit. We have many models displayed and a knowledgeable staff that can answer any questions you might have. We’re easy to find if you’re in the East Texas or Dallas area, Contact Us and we’d love to have you come by and visit us.